Shingwedzi is one of my favourite camps. It sits on the banks of the river of the same name and at sunset close to the camp it's possible to get magnificent views of the sun as it sets in the west and falls below the meandering river. Waypoints 133 to 136. The drive along the S52 is one of those highly recommended drives. Before starting the main drive I did a short loop that showed great promise ... 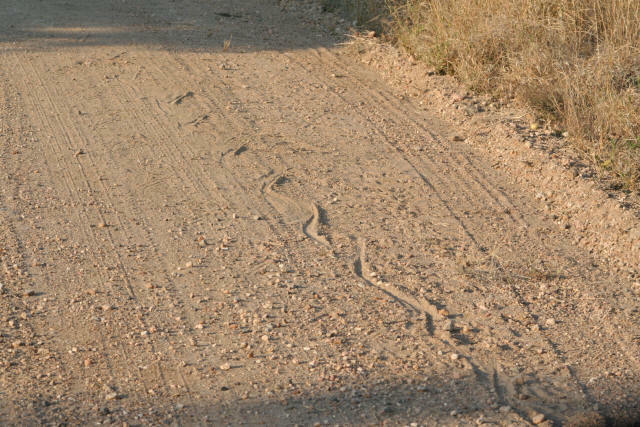 Shortly after entering the short loop road I came across the equivalent of "footprints in the sand"... track marks made by a large snake! The picture is of an undulating side to side "S" you see here I believe had been made shortly before I arrived at waypoint 135. I assumed after a lot of thought it was made by a large heavy snake. Maybe an African Python ... Waypoint 135 ... The picture is one a few I took as I followed the "S" shaped track in the sand first seen at the side of the road only to disappear and reappear and move to the centre of the road. It seems I had just missed a great sight. Now I can only wonder. Do you? Read more here ... Tomorrow I would see an African Python. 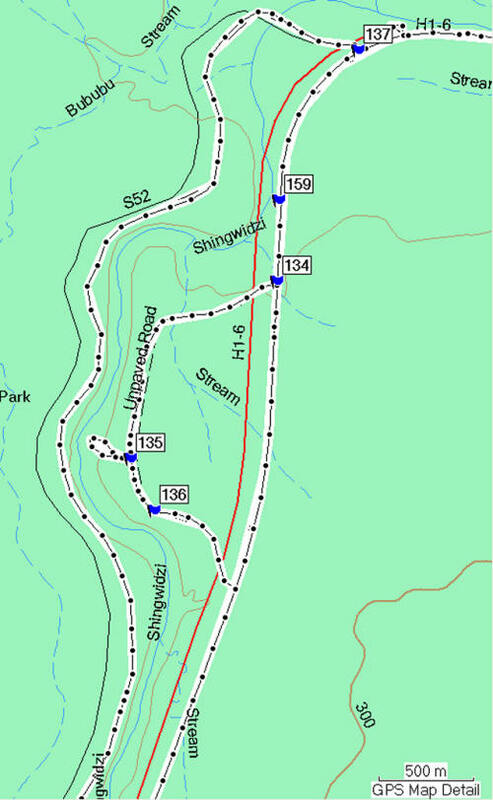 Waypoints 133 to 136 cover the short S101 Shipirivirhi (means two difficult tasks) loop with a look-out point over the river of the same name loop on which I saw a most interesting sight I've described in a separate article. Waypoint 134 was the turn off the main H1-6. Waypoint 133 ... An early morning (07.35) view of the Shingwedzi close to the camp and the Marabou Storks are only just waking up it seems. Waypoint 135 was a look out over the Shingwedzi. 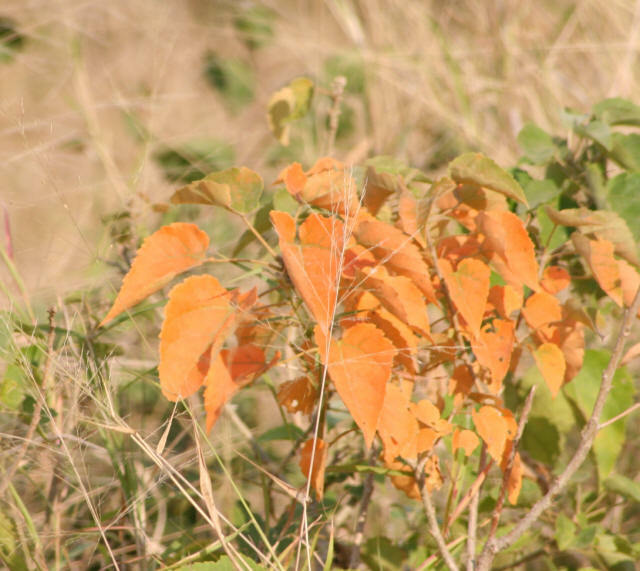 The picture shows the remarkable orange colour on a shrub which for the most part was still green. Leaves display these magnificent Autumn colours because the pigments responsible are no longer "masked" by the green chlorophyll pigment. It is a sign that the plant has removed the nutrients from the coloured leaf in preparation for winter. 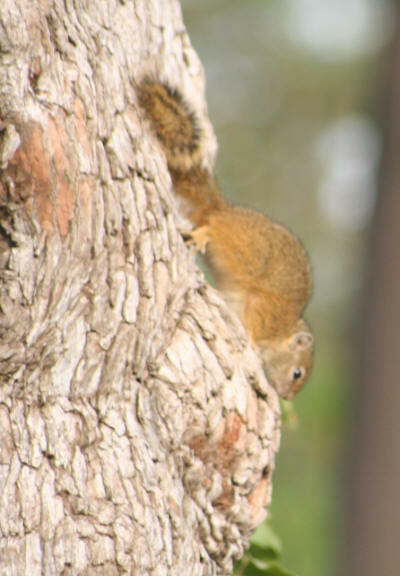 Waypoint 136 ... Not all mammals in the Kruger are big and fearsome. 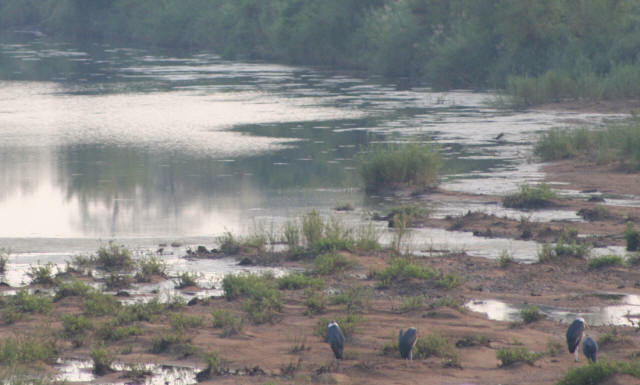 If birding is the objective of your visit to Kruger it is best to stop in different places and let the birds come to you. You will have many opportunities to do this on the Kanniedood drive and especially so since there are 2 "get out" bird hides on the route Here's the link to all Kruger birds.